Find hotel near Memorial Minas Gerais Val ..
It’s a museum, not a memorial. 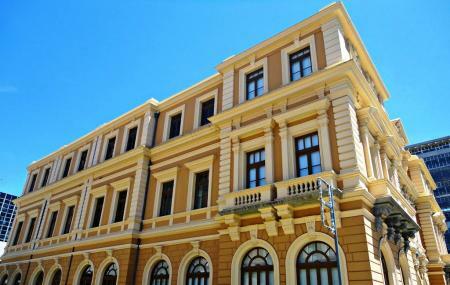 The historic and beautiful neo-classical 1897 building is where Belo Horizonte’s foundation stone was set. The Vale is a major mining company with its roots in this city. In this museum, it pays tribute to those roots in two ways. First, it promotes dialogues with the artist community, and second, it strives to narrate the cultural and historical significance of miners in the region. There’s no particular order to touring the three floors of the museum. First Floor: Thematic multimedia exhibitslife and work of artists symbols of Minas Gerais. Third Floor: Folklore, shows, cinema, performances and exhibitions – all with the aim of connecting the history of Minas Gerais to the history of mining. There is paid parking on the streets. No high heels, yelling or running. How popular is Memorial Minas Gerais Vale? People normally club together Centro Cultural Banco Do Brasil Belo Horizonte and Praca Da Savassi while planning their visit to Memorial Minas Gerais Vale. Free entry. Some really interesting and original audio-visual presentations of historical information. I really like the room full pf talking portraits with spinning chairs. This is a betiful building on the main square. The museum has a permanent Salgado exhibition, this is a spectacular showcase of his work. There are exhibits that explain the history of the area. Many in English as well as Portuguese. A great place to visit to understand the area. Its different exhibitions tell a detailed history of the state of Minas Gerais, its people, culture, religion, arts and traditions in a very light and entertaining way.